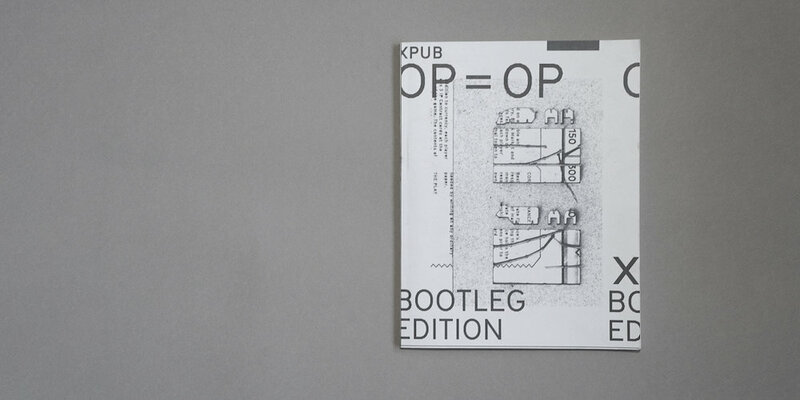 OP=OP Bootleg is a second edition of the OP=OP publication developed and produced by the students from Piet Zwart Institute, Master Media Design, Experimental Publishing course. Derived from Monopoly, the publication takes the form of a board game that explores the topic of scarcity, with players competing for assets, services and raw materials, following their pre-defined agendas, establishing both regulated and unregulated trade transactions, while witnessing an accelerating depletion of all resources. By amplifying, modifying, and adding to the initial rules of Monopoly, OP=OP aims at triggering discussions on property, trades, ecology, and markets, thus breaking through the consumerist sugarcoating culture of the infamous board game, and bring back to light its origin as a critical device. In collaboration with: Emily Buzzo, Max Franklin, Giulia de Giovanelli, Claudia Giralt, Pleun Gremmen, Franc Gonzales, Julia Kul, Margreet Riphagen, Kimmy Spreeuwenberg and Noemie Vidé. Process lead by Delphine Bedel. The American Book Center in Amsterdam has asked us to create the OP=OP Reboot using their Espresso Book Machine. In contrast to the first edition which was handmade and scarce, the second edition was print on demand. The machine takes roughly ten minutes to print and bind the book together. Although the production would become more efficient, this created a challenge for us to convert the crafted limited edition into a flat PDF design. This is why we decided to photocopy all the pages to mimic the perception of artificial scarcity. Publication part of the Special Issue group projects of the Master of Media Design students from the Piet Zwart Institute, Willem de Kooning Academie, Rotterdam. Experimental Publishing students who created and contributed to the publication are: Emily Buzzo, Karina Dukalska, Max Franklin, Giulia de Giovanelli, Claudia Giralt, Pleun Gremmen, Franc Gonzales, Julia Kul, Margreet Riphagen, Kimmy Spreeuwenberg, Noemie Vidé. For more content visit the official XPUB Special Issues.